I got a pedicure Thursday and now look down at bright coral toenails that don’t look a bit like mine. During that hour of pampering, I discovered my feet are a great deal more ticklish than I’d realized. Everyone in the shop was laughing with me because–for a few minutes–I couldn’t stop. Why did I have this, only my second pedicure? Because I’m leaving for the national conference of Romance Writers of America today where I’ll join 2,000 of my best friends in San Antonio. Probably half the writers in Texas and many from the rest of the US plus members from Canada and Europe and Australia and other places will gather there for days of networking, workshops, greeting old friends and making more. I’ll be participating in two signings, several parties and will be “doing” breakfast and dinners with friends I’ve known through RWA for fifteen years or more. What fun! 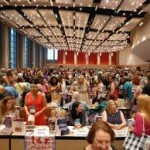 When I went to my first RWA conference in 1995, I entered the ballroom for the book signing. 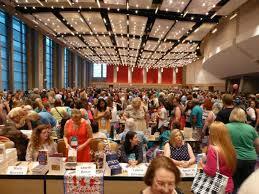 Saw rows of tables, hundreds of writer with their books stacked in front of them and hoards of readers wandering through. At that time, I vowed, “I’m going to be here someday.” Six years later, I was. After ten books, it’s still fun. I’ve rested up for this and have nap time scheduled so I won’t wear out before I have to drive home, but I’m ready! Just have to pack, take the kitties to the spa, and take off! Hope you all have a wonderful week. Hope to see some of you in San Antonio.